If you looking for the most reasonable, creative and genuine website design and development company!! Kalyan Infotech proves to be the best solution for you. The services offered by Kalyan Infotech Web Development Company, such as custom web applications, Graphic Design, e-commerce Solutions, Shopping Cart Solutions, Content Management system, CD Presentations, Logo Design, Flash Animations, Online catalog, database design and maintainence, ecommerce web solutions,software development, search engine optimization and search engine marketing, web hosting, Domain name registration, Bulk SMS and many more. Mr. Kalyan Chakravarthy, who is having experience of 19 years in Software Development and 11 Years in Web Designing and Developments. And he have an experience nearly 2200+ websites in different categories like Realestate, Corporate, Business, Online Ad Agencies, Classifieds, Yellowpages, Matrimony, City Portals, Job Portals, Shopping Carts, Payment Gateways, e-commerce Solutions, Time Sheet Management, CSS Theme, SEO (Search Engine Optimization) websites. And he has nearly served 600+ clients for offline Softwares since last 15 year in different organizations within India and overseas. Whether you have yet to take your business on the web, or if you are looking to improve your existing business, Kalyan Infotech (web design company from Visakhapatnam (DC) provides the services to make it successful. Kalyan Infotech offers the best quality services in real time. Kalyan Infotech provide quality Designing and Genuine Web hosting at very afforadable prices. Kalyan Infotech understand the needs of our clients, and provide customized web design and development at affordable rates. Kalyan Infotech understand that your website is the key to your success in bringing value to your Customers, who often have only a few seconds to take business decisions when visiting your website. your website should leave the best impression on your Customers in this short duration of time. To maintain a competitive edge in the ever-changing digital marketplace, every website needs to be nurtured with care. Kalyan Infotech design, develop and maintain websites for you and provide periodic reports listing and our recommendations for improvements. From building new websites to re-launching existing ones, Kalyan Infotech proves to be a quality resource for you. Mr. Kalyan Chakravarthy has the skills and the experience to assist you manage your website effectively. He expertise in a wide spectrum of technologies with in-depth knowledge of their areas of specialization. He will create web applications that are appropriate and complete based upon a thorough understanding of the end user, work flow, and high level requirements. Kalyan Infotech is a proven website design and Development company that is customer centric, is focused on long term stability, and has a leadership team of seasoned web services professionals. The needs of your business are the focus of the webdesign process in Kalyan Infotech. Kalyan Infotech design your Custom website to empower your business by delivering You measurable business growth. Kalyan Infotech follow an approach that synthesizes the complete design, development, and maintenance of your website with revenue generation in your business. You are involved in all the stages of the design and development of your website to assure value addition in your business. Kalyan Infotech web design and development seeks to empower your business. Kalyan Infotech delivers your website to enable growth in your business that You can see and measure. So that we can assure value addition and creation in your business, we involve You closely in every step of the project. You will review deliverables, give feedbacks, and approvals with the Kalyan Infotech team of experts. your website design will be the outcome of the expertise we dedicate to your business insights. 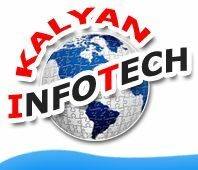 Kalyan Infotech will Design your Unique Custom Web Site, Manage and Maintain it, Host it and Consult with you on Promoting it.